Born in Ecuador and raised in the Bronx, Oscar Bermeo is the author of the poetry chapbooks Anywhere Avenue, Palimpsest, Heaven Below and To the Break of Dawn. He makes his home in Oakland with his wife, poeta Barbara Jane Reyes. He has facilitated poetry workshops at Rikers Island Penitentiary, the Oakland Public Library’s Oakland Word Program, UNC-Chapel Hill, Mind-Builders Creative Arts Center, the Bronx Academy of Letters, Teatro LATEA, Dias y Flores Community Garden, and Youth Ministries for Peace and Justice, among others, and led poetry discussions and seminars in schools throughout New York City and Oakland. Oscar has been a featured writer at a variety of venues and institutions including the Nuyorican Poets Café, the Bowery Poetry Club, St. Mark’s Church, WBAI radio, WGLT Poetry Radio, Kearny Street Workshop, Intersection for the Arts, La Peña Cultural Center, The Loft Literary Center, Sacramento Poetry Center, National Hispanic Cultural Center, Studio Museum of Harlem, Litquake, San Quentin Prison, Alameda County Juvenile Justice Center, Columbia University, New College of California, California College of the Arts, Illinois State University (Normal), Amherst College, William Paterson University, Syracuse University, University of North Carolina at Chapel Hill, San Francisco State University, University of California at Berkeley, New York University, and many others. His poems appears in the anthologies From Page to Stage and Back Again (Wordsmith Press, 2004); PARSE, Vol. 1: Alchemy (Friendly Fire Press, 2004); I Just Hope It’s Lethal: Poems of Sadness, Madness, and Joy (Houghton Mifflin, 2005); Same Time, Same Place: a book of poetry (Kearny Street Workshop Press, 2006); Points Not Found: Writings on the Meaning of Place (Kearny Street Workshop Press, 2006); 12 Ways: An Anthology of the 2007 Intergenerational Writers Lab (Kearny Street Workshop Press, 2007). Oscar’s work can also be found in the journals Achiote Seeds, vol. 2 (Achiote Press, 2007); OCHO #15 (Menendez Publishing, 2008); Small Press Distribution’s New Lit Generation, Spindle, the November 3rd Club, In the Grove, CrossBRONX, among others. His work can also be heard on the Agony Column Podcast, Pinecones | A Podcast of Young Poets, the Sacramento Poetry Center archives and the CD, 5 Past 13— A Little Bit Louder: Volume 1 (louderARTS Project, 2003). 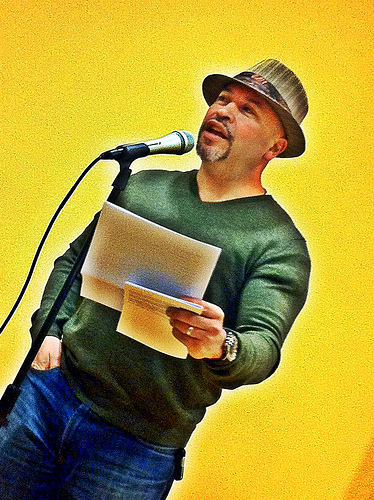 Oscar was the founding curator and host of the Acentos Bronx Poetry Showcase, a twice monthly showcase of emerging and nationally recognized Latina/o poets, in the Mott Haven section of the Bronx. He was also a founder, curator and host of synonymUS, a multidisciplinary poetry series at the Nuyorican Poets Café. Oscar was a SlamMaster for Team louderARTS|NYC (2002-03) and served on the Rules and Protest Committee of the 2005 National Poetry Slam. He is a BRIO (Bronx Recognizes Its Own), CantoMundo, IWL (Intergenerational Writers Lab) and VONA (Voices of Our Nations Arts Foundation) writing fellow.